If you've discovered a couple of chewed up cereal boxes, some shredded old newspapers, and a suspicious hole in your sofa, then congratulations, you are the proud owner of a rodent family! But wait, there's more! Do you know what the missing cereal means? Exactly - mouse poop. As funny as it sounds, mouse droppings are a matter to take seriously. They are a sure sign that you have a home invasion and can be dangerous to your health. If you come in direct contact with the excrements, you can contract diseases like Hantavirus, Hemorrhagic Fever with Renal Syndrome and Lymphocytic Chorio-meningitis. Today we will learn the difference between a mouse and rat dropping, what do mouse droppings look like, how do they spread diseases and the right way to clean them. It's important to properly inform yourself on the topic, especially if you have any speculations that you are running a rodent hotel. This way you ensure a safe, clean and healthy home for your family. Mouse droppings are about 3-6 mm long, with a granular shape and black in colour. For comparison, they are a bit smaller than a rice grain. They are a little bent as well. You can find them "distributed" into small bunches near the mice nests. They are similar but smaller than rat droppings. Nonetheless, "rat poop" presents the same dangers and should be handled with equal care. As mentioned above, mice droppings are distinguishably smaller than the rat ones; about half the size. They are different in shape and texture, too. Mice poop looks a bit crunchy, while the rats are sausage-shaped and appear soft and wet. The second type you can find again into small bunches that contain around 40-50 droppings. To sum it up: mice poop more frequently and produce more "brown presents", while rats are exactly the other way around. I saw a mouse in my house but no droppings, what does that mean? That's actually a good thing. It means that you are not dealing with a whole family of mice. If lady luck is on your side, you probably saw a single random rodent, which just happened to wander inside your home. Sometimes, especially if there any construction work in your neighborhood, like sidewalks being dug up or extensive sewer work being done, mice may appear inside your home, only to get away from the stress of the construction site. To be on the safe side, we advise you to set a mouse trap and to keep an eye for any other signs of infestation like droppings, torn paper, and suspicious sounds. If you manage to corner a mouse, don't attempt to grab it as it can bite you. Although not that painful, mouse bites also hold the risk of transmitting diseases. So, What Diseases Are Spread Through Mice Droppings? Additional hantavirus symptoms include headaches, dizziness, chills, nausea, vomiting, diarrhoea, and stomach pain. If the illness isn't caught early, it could lead to HPS – a deadly syndrome that causes your lungs to fill with fluid. Is HPS scary? Yes, quite so. And mice are not the only ones who spread it as rats can also be the culprit. But there is no point in panicking over how frightening the symptoms sound, is there? It's best to book a reliable pest control for mice and learn how to clean mouse droppings properly. Where Should You Look For Mice Droppings? But What Do I Do If I Find Mice Droppings? If you spot mice droppings anywhere in your property, never touch them barehanded. Always use protection such as rubber gloves to minimize the risks of infection by the diseases they carry. This is a must. Don't go into full "OH MY GOOD! MOUSE POOP! MUST CLEAN NOW!" mode. Your initial reaction will be to sweep the excrements or to vacuum them. Both of those are bad ideas because they can expose you to even more health dangers. As we discussed earlier in the article, never ever handle mouse (or rat) droppings without gloves. At the moment you see mouse or rat dropping, ventilate the room you found them in. Open the windows to let fresh air in and to lower the chances of breathing in disease-causing microorganisms. When you collect the brown presents, put them in a zip-lock bag and throw them in the trash bin, preferably the one outside your house. Continue trapping the mice for a week. Start the cleaning process only after no further mice have been trapped. Ventilate the space for 30 minutes. It's best to open two windows on the opposite sides of your property. Wear protection on your hands – rubber or latex gloves should do just fine. Spray the mouse droppings with one-and-a-half cups of bleach to a gallon (4.5 litres) of water (a 1 to 10 ratio) – do this before starting the cleaning process. Leave the disinfectant to settle down for 5-10 minutes. Use plastic bags to scoop up the mouse droppings. Disinfect any areas that were in contact with mice or their droppings, especially kitchen cupboards, countertops, and cabinet shelves. Wash your hands with soap and water after removing the gloves. Do not touch your eyes, mouth, or nose before washing. It's crucial to disinfect the mouse droppings before cleaning or going near them. HPS can be transmitted not only by coming into contact with urine or droppings but also through the air. "When fresh rodent urine, droppings, or nesting materials are stirred up, tiny droplets containing the virus get into the air. This process is known as “airborne transmission." Furthermore, finding and identifying the mouse droppings is every bit as important as the cleaning precautions. 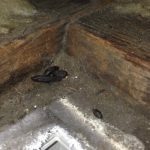 Any home that has gone through a mice infestation, no matter the size, needs to be thoroughly cleaned and inspected for mouse droppings and nests. If mice droppings have contaminated your bedding, clothing, or even your offspring's favourite stuffed animals, you should immediately wash them with hot water and a laundry detergent of your choice. However, don't forget to use rubber or latex gloves when handling the soiled items and always set your dryer to 45℃ to render the hantaviruses inactive. In case the mice have done a number two on your furniture or carpet, it's highly recommended to thoroughly wash those with either a disinfectant, a commercial steam cleaner, or a shampoo. As for desecrated books or important documents, simply wipe the mouse droppings off with a cloth and a bit of disinfectant and leave the items in direct sunlight for several hours. The reason for this is simple – hantaviruses can remain active for up to three days under normal conditions, but they will become inactive when exposed to ultraviolet rays for a prolonged period of time. The best solution for the mouse poop problem is to attack the source, of course. No rodents means no droppings. We advise you to opt for e professional exterminator. The experts will end your troubles quickly and efficiently. And when it comes to the task of cleaning the excrements, you can also turn to a professional. After all, nobody likes to deal with disgusting things like mouse poop. We share helpful information according to the experience and know-how of the pest technicians. However, we don't provide any medical advice.